Black & Decker Travel Iron Review: The Black & Decker X50 Travel Pro Iron is an iron great for traveling purposes. Now, you no longer have to worry about looking rumpled or untidy during vacations or business trips. 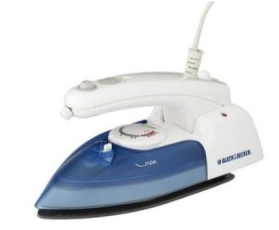 A standout feature for this iron is that its handle folds flat allowing easy storage in any suitcase or traveling bag. The Black & Decker X50 Travel Pro Iron is an iron whose lightweight and compact design makes it great for traveling purposes. The comfortable handle of the iron folds down as well to allow the device to fit even better into any traveling bag. The dual voltage system of the iron also allows it to be used all over the world. This iron comes with a unique non-stick soleplate, which prevents fabric from sticking or clinging to the item while ironing. This prevents your clothes from becoming singed or burned. The Black & Decker X50 Pro Iron’s water reservoir is removable in order to conveniently fill up and empty out the iron’s water content. The variable steam function and spray mist system are useful as well in ironing all types of fabrics as you wish. Most people are satisfied with the Black & Decker X50 Travel Pro Iron and happy with how it works. The iron does what it promises. Its lightweight design is good for bringing along on different trips. One thing that some people have noticed about the iron is that at times, it doesn’t produce a healthy amount of steam and therefore does not iron over clothes well. The Black & Decker X50 has been reviewed by 43 customers on Amazon with a rating of 3.6 out of 5.0. See the latest user rating on Amazon. Many customers like the size of this tiny iron, which makes it great for bringing along on trips. It doesn’t take up much space, thanks to the foldable handle and compact overall design. Many quilters appreciate this iron as well, for its ability to flatten down a number of different fabrics. The stainless steel soleplate and spray mist features have been commended as well. Some people have recognized problems with the device’s inability to produce a good amount of steam. Overall, the Black & Decker X50 Travel Pro Iron is a handy, little iron that is easy to bring along on any trip. It handles a variety of fabrics with ease. The soleplate of the iron glides over clothes smoothly and doesn’t catch on difficult fabrics. I recommend this product to anybody looking for a simple iron that they can easily bring along on vacations. If you are looking for a fancier iron however, with a variety of different functions, then maybe the Black & Decker Pro Iron is not for you. Try looking for a bigger iron, for more heavy duty assignments as well. If you enjoyed reading this review then read an in depth review on the Sunbeam Hot-2-Trot Travel Iron.